Acting as a stable social hub to learn new skills, receive support and advice, Veterans’ Garage is a unique project providing support to military veterans across the North West. Bringing ex-servicemen and the local community together, Veterans’ Garage has been conceived as both a PTSD support centre and a venue for fundraising and awareness for both veterans and local causes. Veterans Garage occupies the second floor of a building at City Airport & Heliport, Manchester. Donated to the charity, the building is a modular steel frame structure, with portacabin units that are insulated and double glazed, but still needed considerable work to meet the functional needs of the centre, not least heating throughout. 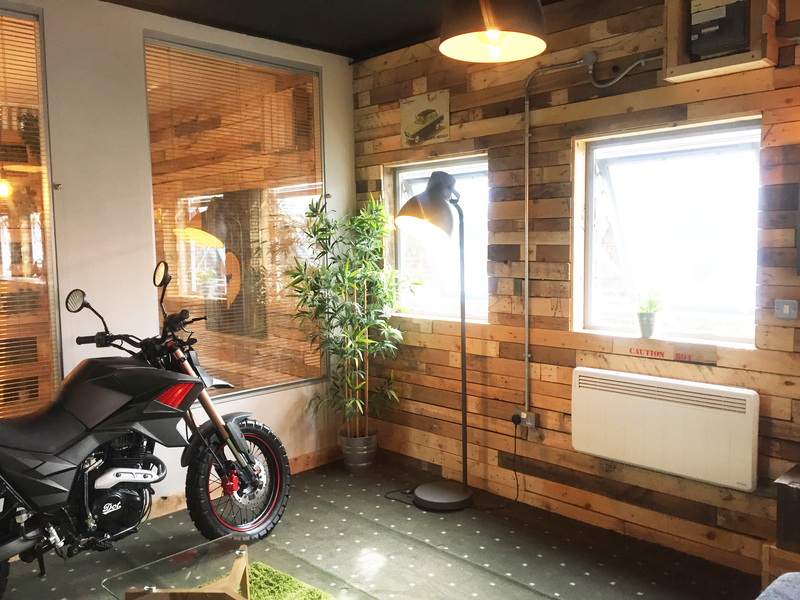 With the location supported by an electric-only connection, Veterans’ Garage co-founder David Redshaw turned to electric heating experts Dimplex for help. 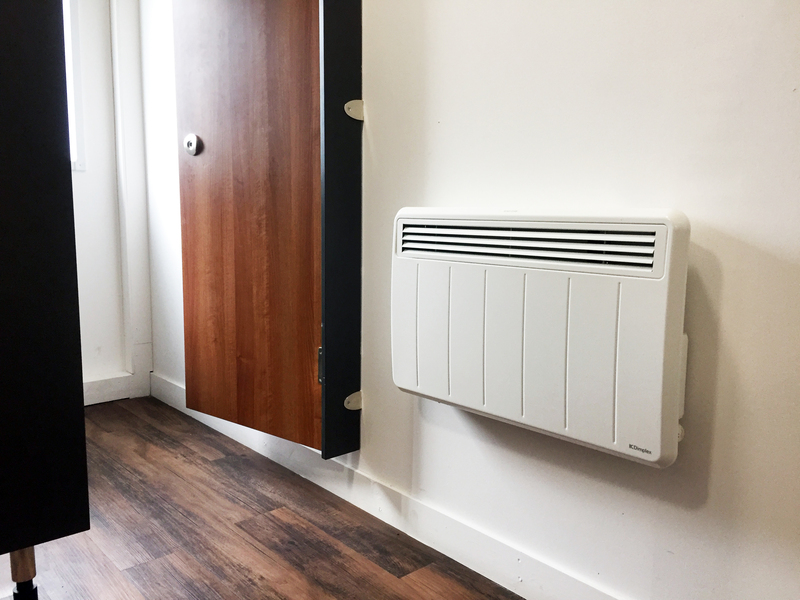 The Glen Dimplex Heating Applications Design Department reviewed the needs and modelled a response to ensure the property remained comfortably warm through the colder months. With 13 areas to be heated, including reception, lounge, office, consultation rooms, classroom, toilets and corridors, all of different sizes and configurations, the team was able to specify for all the required heating needs from the Dimplex PLXE range of electrical panel heaters. Dimplex’s PLXE is the latest generation of installed electric panel heaters. The range of seven different models, which are all EcoDesign compliant, offers a choice of smart, space-saving and efficient electric heating appliances for domestic and commercial projects. PLXE heaters include electronic thermostat control providing stable, accurate room temperature and the versatility of an integral 7-day timer. A range of user-configurable timer modes and continuous heat modes are available to make things as easy as possible when it comes to managing warmth throughout the centre. The heaters feature predictive technology that learns the thermal properties of the room over time, allowing them to turn on at exactly the right time to achieve desired temperatures. They also recognise if a window is left open and will shut off automatically to prevent wasted energy. In all, 22 appliances that encompassed most of the range were specified and donated to the charity for installation according to the heating plan. A PLX050E and PLX125E were used for the corridors and the rooms took an even split of PLX150E and PLX200. As all PLXE heaters are splash proof, they also made a good choice for the toilets. The slimline design will also cover most traditional panel heater fixing marks, so they are perfect for refurbishment work such as was needed throughout the Veterans’ Garage project. As well as the social function of the centre, there are a number of therapy and consultation rooms. Because Veterans’ Garage is a non-clinical environment, its easier for those using the facilities to open up and talk, especially with outside resources such as the NHS who now come to the centre to support those with PTSD. The rooms also provide an important role with solicitors visiting to help with legal advice. Its an unfortunate by-product of PTSD that marriages can break up, so there is a real need for support and advice. This can range from agreeing on visitation rights with children through to advising those veterans who find themselves homeless about how to go about getting a roof back over their head.